There’s nothing worse than being smack dab in the middle of a project and not having what you need or running out of something! Gift wrap is common offender. You’ve brought out all the supplies, selected a paper, have one side taped up and then you hear that noise—the noise the tape makes when there is half an inch left. Suddenly, you’re frantically looking for tape, that is nowhere to be found, and the next thing you know you’re headed to the store JUST.TO.BUY.TAPE. Ugh! Over the last few years, in an effort to simplify life, I have drastically paired down my gift wrap assortment. I’ve always enjoyed wrapping gifts; however, my ‘assortment’ of paper, tags, tissue and toppers had truly become unruly and unusable. At first, the idea of pairing down felt like robbing myself of something I enjoyed but, in the long run, I’ve come to find it actually gives me (and my space) more freedom. Rather than have multiple rolls of paper for every occasion, pick a scheme. I chose Kraft and white matte wrapping paper because I felt, with the help of ribbon and toppers, I could achieve the most ‘looks’, from rustic and natural to glitz and glam. Below are a few examples. Are you as surprised as I was with the versatility just two papers could create? Rather than beg, borrow and steal supplies from other areas of the house, when wrapping, invest in a few tools that remain in your gift wrap tool box. Here’s a shortlist of favorites. Whether you’re a minimalist or a maximalist gift-wrapper, having supplies organized and easily accessible will make the process easier and more enjoyable. Compile & Sort: Gather up all gift wrap and supplies. Determine what stays and what goes. Further sort your “keep” pile by like items; e.g. put all the wrapping paper together, tissue paper, bows, etc. Inventory: What are you missing? What are you low on? Add those items to your shopping list. Storage: Access the overall size of your gift wrap collection. Don’t forget about the items items on your shopping list. Determine what type of storage will be the best solution, inclusive of where it will be stored in your home. Assemble: Now that your gift wrap collection has been tidied, perhaps simplified, and restocked with missing essentials, it’s time to put things in their designated place. 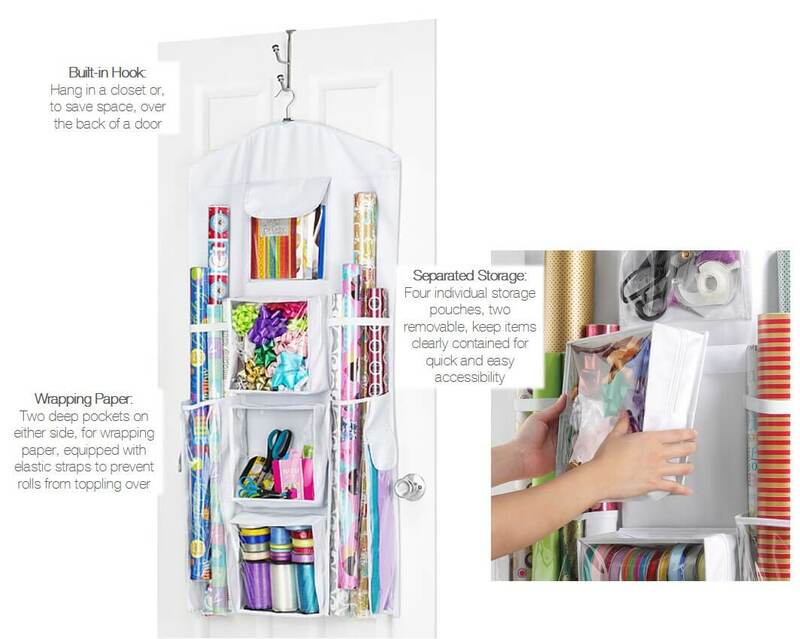 At less than $15, Whitmor’s Hanging Gift Wrap Organizer is truly one of my favorite storage options. The design is well-thought-out, its durable, doesn’t require much space and it’s affordable.